According to leaked pre-order figures, Amazon’s Kindle Fire tablet offering – focused primarily on video and streaming media, is set to revolutionize the way we view video – with first month sales set to topple those of the market’s founding father – Apple’s iPad. The leaks, sourced from a verified Amazonian whistle-blower, indicate the Android-based tablet is being manufactured at 2,000 units per hour, which equates to 50,000 per day. One quarter of a million anxious consumers have flocked to Amazon’s and pre-ordered the device in just 5 days, which, if you’ve done the math, means Amazon is bang on track to meet current consumer demand. If the demand continues at the current rate, there will be around 2.5 million pre-orders of the Kindle Fire by launch date, which falls on 15th November. Such numbers, if reached, would place the device on par with the biggest selling first month tablet of all time – the iPad 2. Launched in March, the iPad 2 managed to shift 2.5 million units – a 150% increase from that of its predecessor, which managed just over a million in what is regarded as the inception of the tablet market. 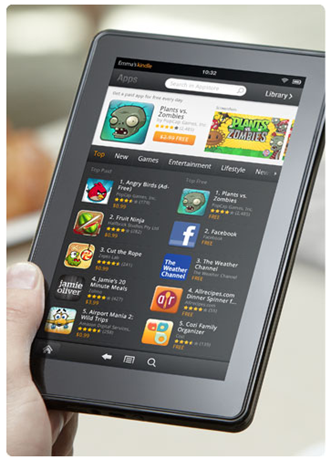 The Kindle Fire is poised to eclipse the million mark, an extremely impressive feat given Apple’s dominance. There is a real buzz about this product, and with good reason. Although the Cupertino’s tablet stripes are not in question, it could be argued that Apple has done very little to push digital video and streaming. Dan Rayburn, Principal Analyst at Frost and Sullivan and online video veteran of 15 years, tends to agree, and reckons the Kindle Fire will "sell like crazy". He went further than just sales talk, though, suggesting that the Kindle Fire do for the digital video industry what Apple’s iPod did for the digital music industry. The Kindle Fire’s arrival couldn’t be better timed, what with rival Netflix giving an abject lesson in how to rapidly lose customers and popularity when delving into the streaming video market. Qwikster was supposed to take Netflix from DVD rentals to online movie rentals in a streamlined fashion. Instead, it turned out to be a PR catastrophe, further blighted by the fact that the @Qwikster twitter name was already taken by a not-so-sober teenager. Netflix has been hemorrhaging money and memberships ever since the July announcement of Qwikster, with shares falling $225 to just $75 whist losing a staggering 800,000 members. Before we all get carried away, it’s important to remember that pre-orders don’t always translate to sales, and Amazon hasn’t sold any yet. But the omens are good, and Apple will be looking over its shoulder with more than just fleeting interest.